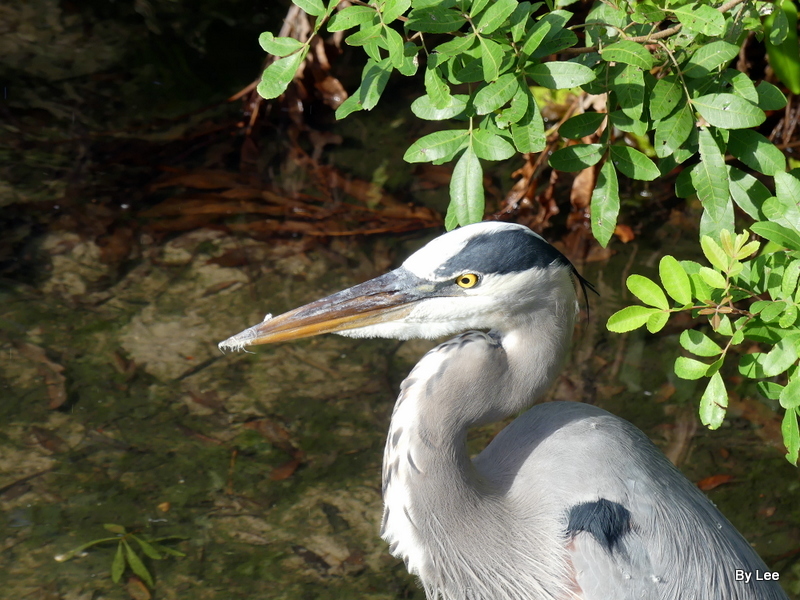 While at the Brevard Zoo last week, I was able to watch a wild Great Blue Heron standing in the river there. 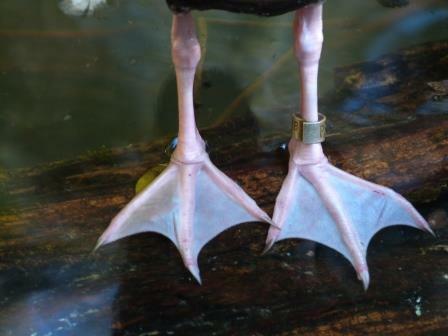 His feet, provided by our gracious Creator, caught my attention. 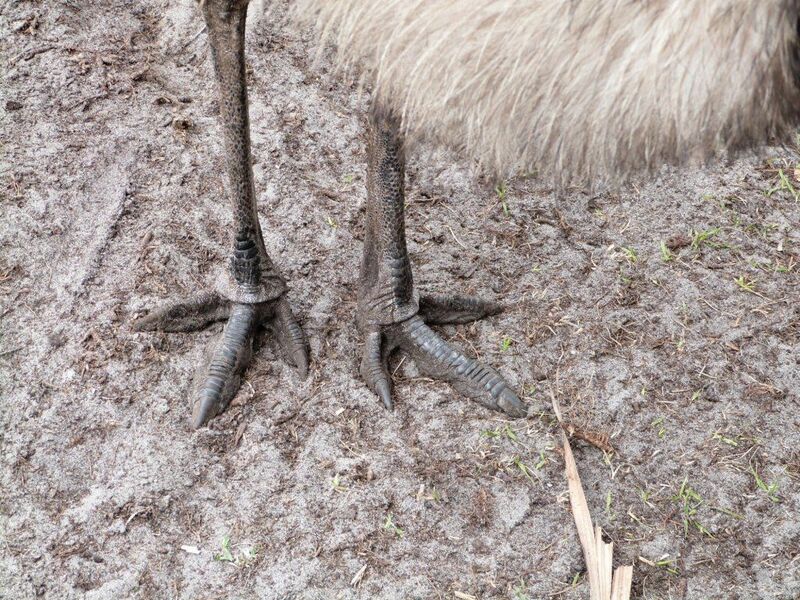 Over the years, I have been fascinated with the feet of birds. 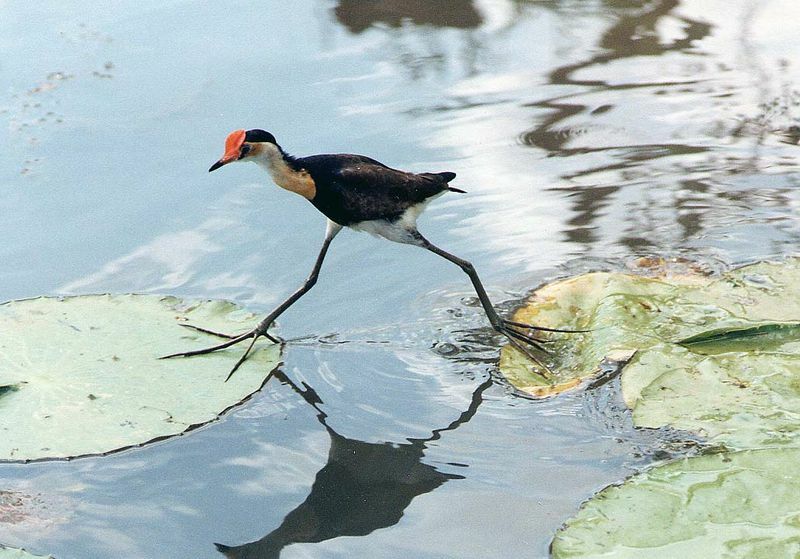 Especially the larger birds that have more height or weight to support in water, land, or on Lilly pads. 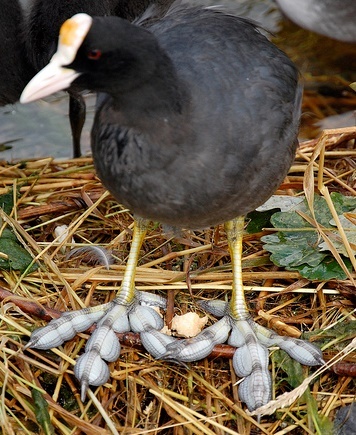 All of these birds were given feet that are meant to meet their needs. The Lord has given us the “Armour of God,” Traditions/teachings of Godly preachers and teachers, preparations, etc. Then He tells us to Stand Firm, because He has provided just the right training for us, just as He has provided just the right feet for the bird’s situations. “Apr.-Oct: mainly inland south to MA; nests early, disperses widely by July. Oct.-Apr. : coast of s n. Eng.” [referring to its range in the New England states]. 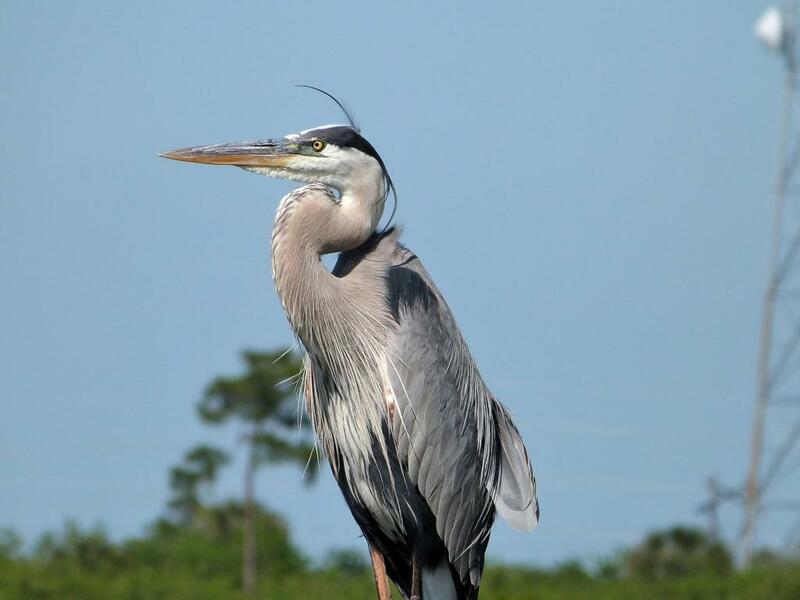 Alden also noted the habitat of the Great Blue Heron: “Marshes, watersides” [and you usually find Great Blues near water — see Lee Dusing’s “Gatorland’s Taxi Service”, posted at https://leesbird.com/tag/great-blue-heron/ ]. 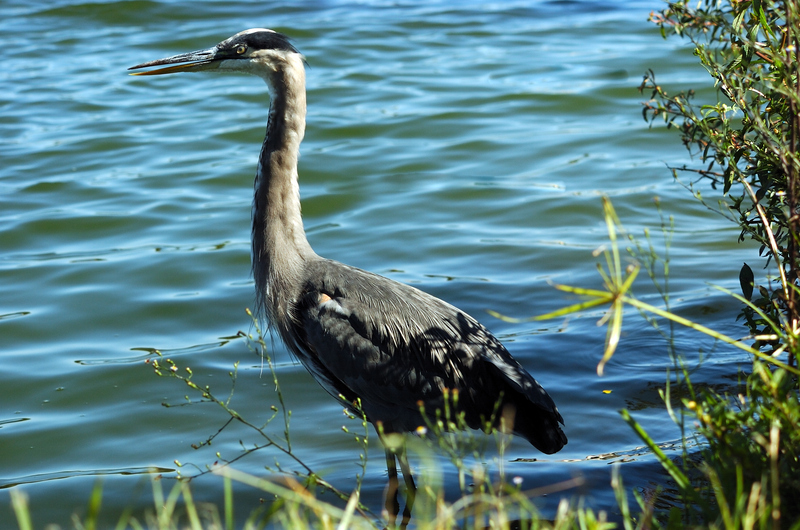 This makes sense — herons are wading birds, frequenting the margins of lakes, ponds, and other well-watered wetlands. 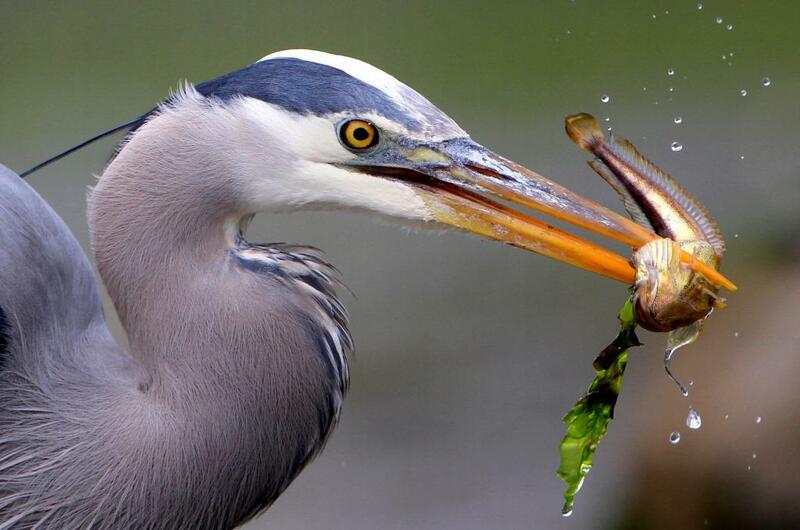 However, don’t be shocked when you find them not-so-close to bodies of freshwater, because Great Blue Herons are good at flying — and they are opportunistic eaters (e.g., crayfish, finfish, frogs, small birds, bugs, small rodents, snakes, etc. ), so they are not limited to pondshores (or seashores) for their dietary opportunities. [See, accord, “Great Blue Heron Couples, Contented with Stereotypical Domestic Roles” , posted at https://leesbird.com/2018/05/31/great-blue-heron-couples-contented-with-stereotypical-domestic-roles/ ]. 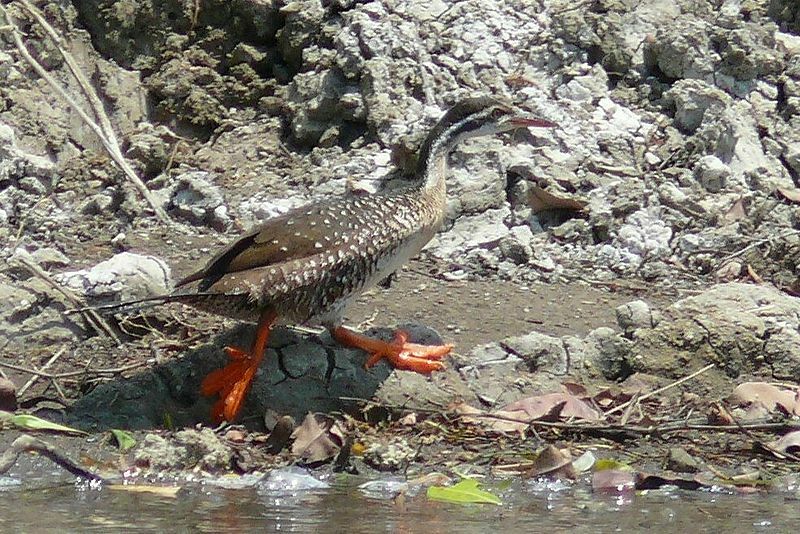 Previous blogposts have mentioned this wading bird’s bold usage of alligator “taxis” [see Lee Dusing’s “Gatorland’s Taxi Service”, posted at https://leesbird.com/tag/great-blue-heron/ ], as well as its opportunistic dietary preferences (e.g., fish, frogs, rodents, small birds, bugs, etc. 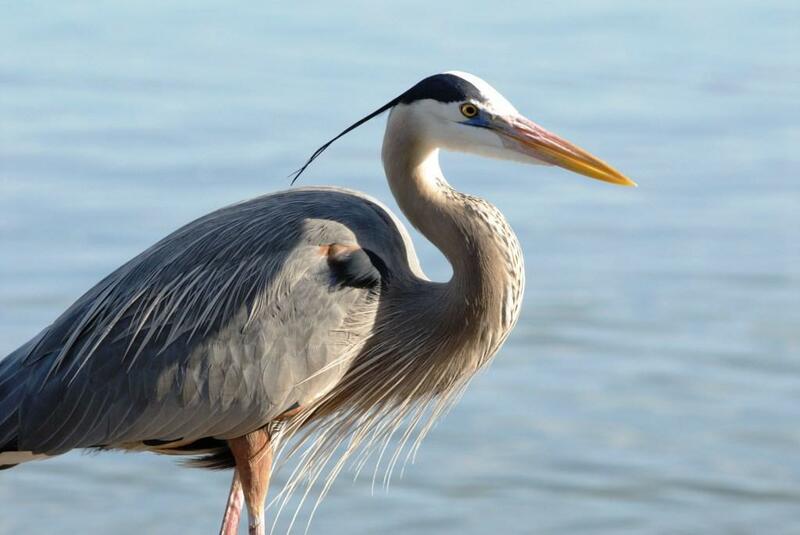 ), so those facts are not repeated here [See “Great Blue Heron: Patient, Prompt, and (Rarely) Pugnacious”, posted at https://leesbird.com/2014/06/30/great-blue-heron-patient-prompt-and-rarely-pugnacious/ ]. GREAT BLUE HERONS. 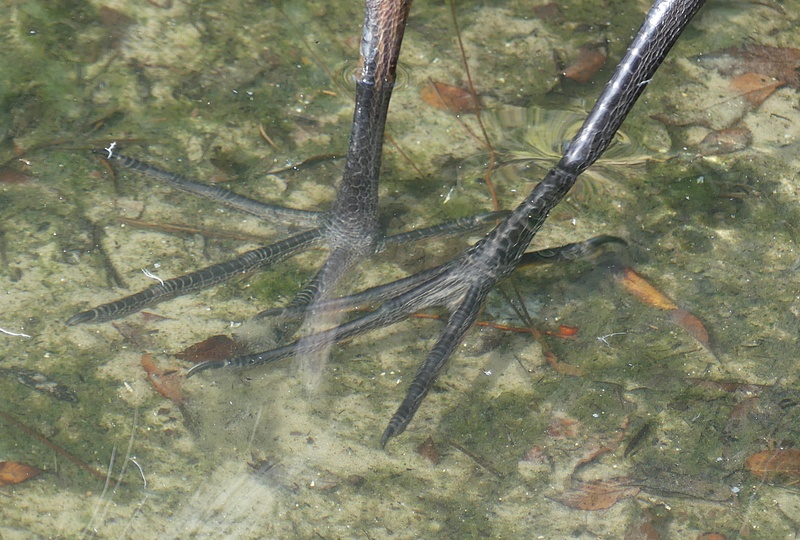 From exchanging twigs to flying in circles, great blue herons participate in a wide range of behaviors during courtship. To construct the big, bulky nest, the male does most of the gathering of materials, picking up sticks from the ground … [or from other places in its “territory”]. The female does most of the work of putting the nest material in place [i.e., she takes care of the home’s interior decorating]. Pairs often reuse old nests [and have been doing this long before “recycling” became a fad], but if they build a new one, it can take three days to two weeks [although it probably takes longer if they are government contractors]. Where do they build nests? Inside trees and bushes, yes, but also in tall marshy weeds, or even on the ground. Great Blue Herons are known to collect tree twigs from nearby trees, including some branch fragments that are too long to be useful as part of a nest, so many sticks are likely to fall to the ground before a pair of great blues get their nest built “just right”. 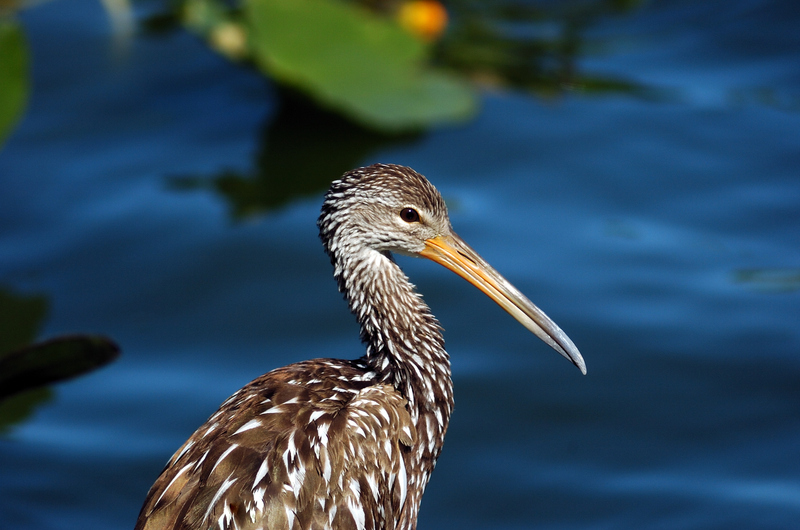 Other nest-building materials include a “lining” of pine needles, moss, grasses, cattail reeds, and/or leaf material. 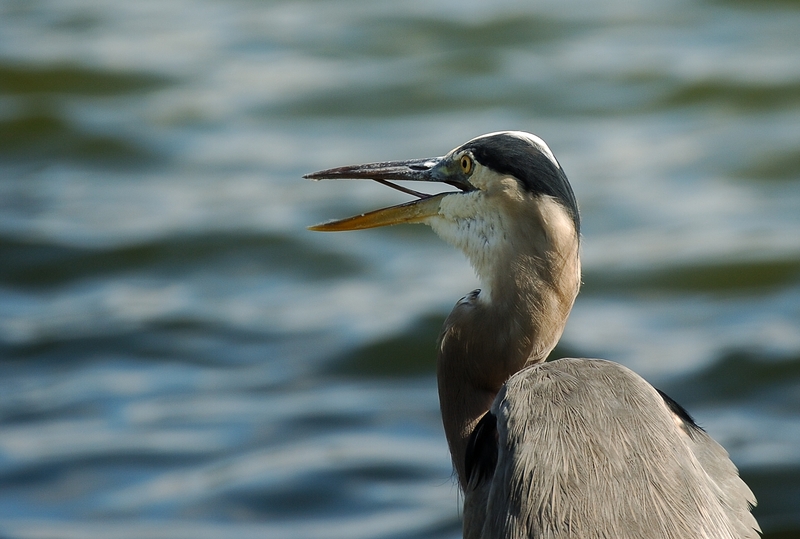 In other words, these herons are as eclectic in nest-building as they are in sourcing their food. May that difference forev’r live long ! 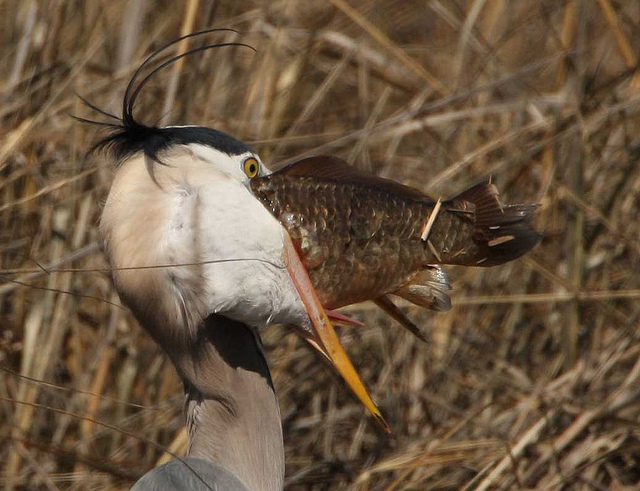 So Great Blue Herons know the difference between male and female roles. What a Biblical concept! As the French would say: vive la difference! Posted in Birds. 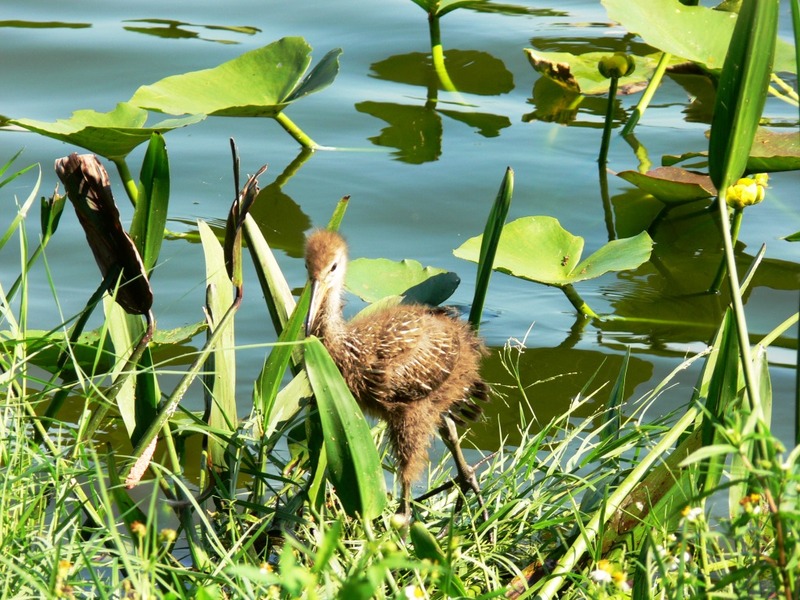 Tagged 1 Peter 3:7, Great Blue Heron, Limerick, Nest Building, Stereotypical Domestic Roles, Vive la difference! To say they are somewhat nuts is mild. It is amazing how some mixed critters seem to get along, though. You saw this photo in Lee’s Three Word Wednesday, but now here is a video of these birds catching their “Taxi Rides” there at Gatorland, FL. In the first part of the video, notice the Great Egret gives the gator a nudge to get moving and the gator raises its head up. 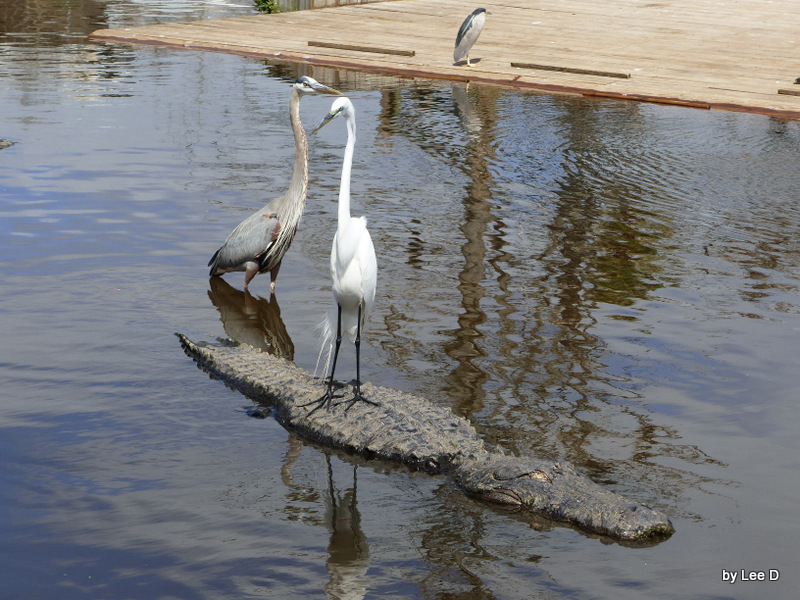 I didn’t realize that the Great Blue Heron was standing on that same alligators submerged tail. Talking to one of the workers, she said every once in a while the gators get hungry. Birds are playing a very dangerous game, in my opinion. Most times these alligators and birds get along fine. People are tossing food to them and so they abide each other. It is amazing how different critters get along. I can only imagine how it must have been when they were first created. There was no desire of the gators to eat the birds. Today, under the curse, it is a totally different situation. That condition shall come again in the future. 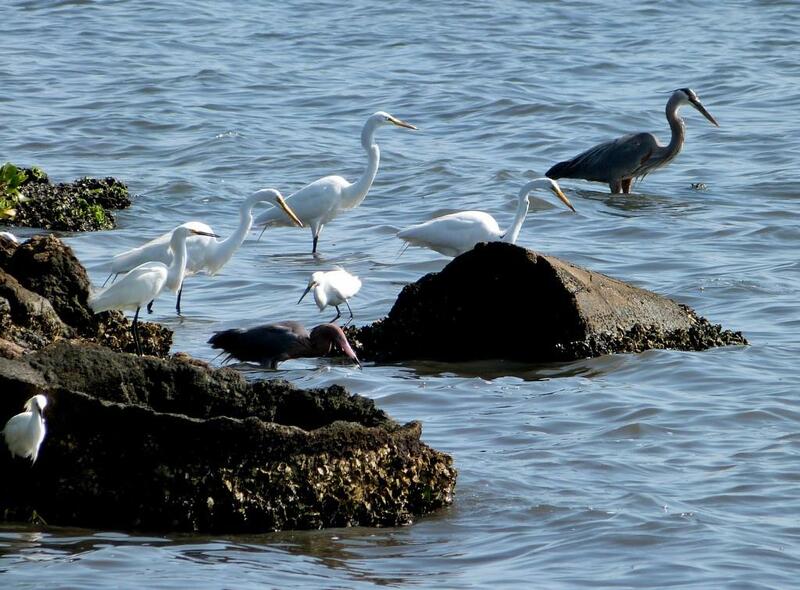 The heron family (family Ardeidae, which also includes bitterns and some egrets) and their cousins include some of my favorite long-legged wading birds: great blue herons, green herons, grey herons, tri-colored herons, night herons, great white egrets, and cattle egrets. 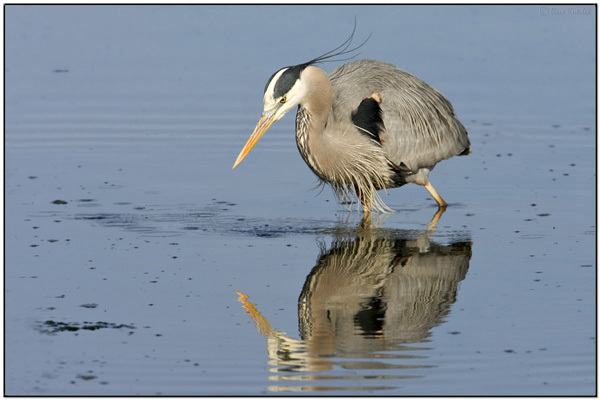 Yet do not imagine that the great blue heron is an erratic hothead that has no self-control, because its self-restraint, when seeking a meal at the shoreline of a pond, is so self-contained that the heron resembles a statue, for many minutes if necessary. Then, zap! 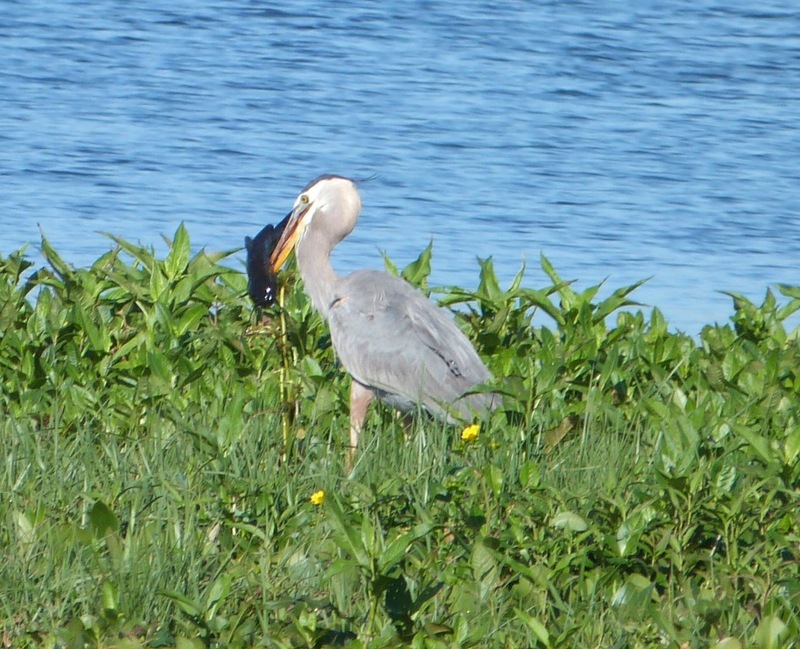 The statue suddenly fast-forwards his sharp beak toward a hapless fish or frog, — and instantly the heron is gulping down his dinner! This ability to strike like lightning, yet the choice to withhold doing so (unless the time for doing so is obvious), reminds us of the New Testament directive: “be ye angry, and sin not” (Ephesians 4:26). Also, in spiritual matters (Ephesians 6:12), we are exhorted to “contend earnestly” for the Biblical faith (Jude 1:3), in ways that do not involve flesh-and-blood fighting. Such spiritual conflicts require both the patience and promptness of a sniper (or an opportunistic great blue heron)! Yes, there may even come a time for the use of physical force, when the stakes are high enough – remember how the Lord Jesus cleansed the Temple with a whip! — but most of the time our anger should be suppressed, with heron-like patience, in order to achieve the most worthy goals in life. Today Dan and I went by Lake Morton for just a short while. We were on our way to have lunch and do some shopping. It was a great day without a cloud in the sky. The temperature was a pleasant 63° (17.2º C). 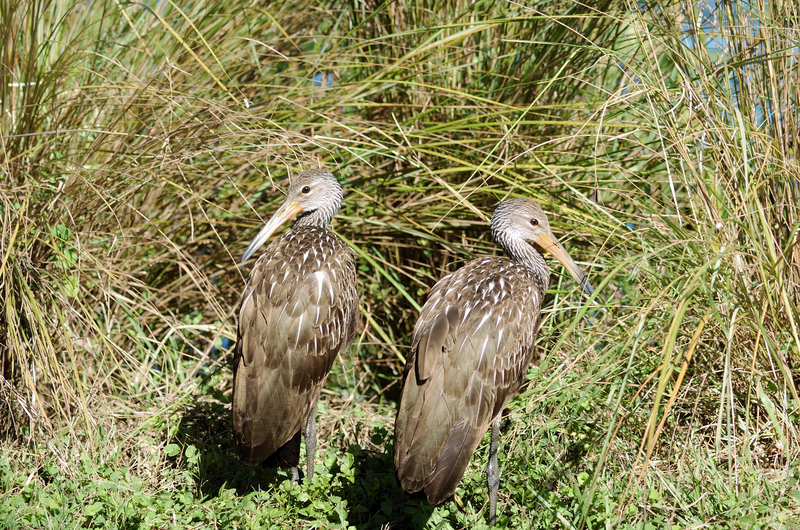 When we were last there, there were 5 young Limpkins and I want to see how they had grown. We spotted 4 of them sunning themselves. They have lost that fuzz on their heads and the spots are becoming quite distinguished. Dan took a great picture of one of them closeup. I can tell by their faces that they are still young. Here is a photo of one when it still had its fuzz. A Great Blue Heron decided to be friendly and came walking toward me while I was feeding some of the ducks. When I tossed him some food, he ate it and kept coming closer. I kept tossing it food and it kept coming closer. What a delight! If I were brave, I would have tried to hand feed him (or her). As I have said in other blogs, this is only one of two places we feed the birds in this area. What did we see today? Besides the 4 Limpkin youngsters and the Great Blue Heron, we spotted Black and Turkey Vultures, a Great Egret, Anhingas, more Great Blue Herons and a Snowy Egret. Those were seen on the way to Lake Morton in Lakeland. At the lake we saw 15-20 Coots (they are back), 3 Wood Storks, 15-20 Mallards, 10 “Aflac” Ducks, Muscovy Ducks, a Great Egret, Laughing Gull, 7 Mute Swans, 2 Black Swans, Boat-tailed Grackle and 10 Ring-necked Ducks (they are back). Our winter visiting birds are finally returning. 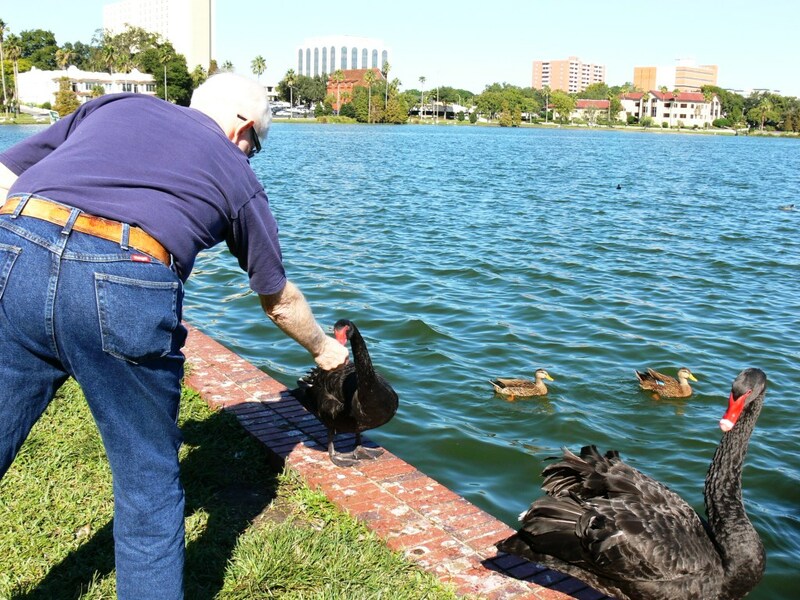 I caught Dan feeding one of the Black Swans. 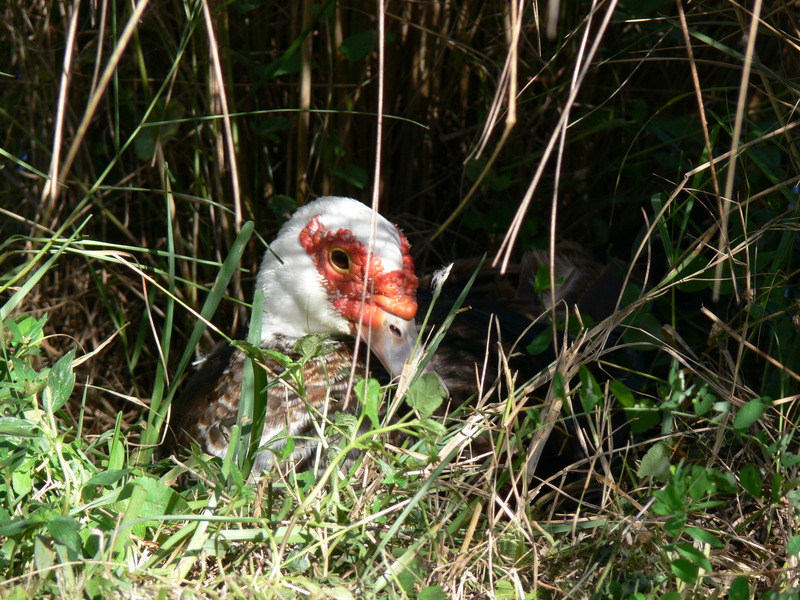 Then I found a Muscovy Duck sitting on a nest with the male standing guard in front. To me, they seem “not so pretty”, but the Lord created all the birds and I am sure His Eye is on the Muscovy as well as it is on the Sparrow. What a perfect day for birding and even though we weren’t there long, the Lord let us see His Creation again, up close and enjoy them.